Tried this myself. The burger lasted 22 days in a relatively humid (I live by a lake) summer environment. 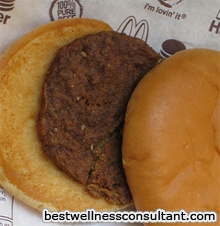 Doesn't mean Mcdonalds is healthy for you though. why would anyone jump to defend Mcdonalds. So that they don't feel so bad while they are feeding chemically altered chicken to their kids? I'm sorry but nothing on that menu is good for you or should be consumed as often as it is. You don't need a degree from som fancy school to know this! I think that all your information is very interesting. I am actually doing a project about McDonalds and how if it affects obesity. I was wondering if you could tell me where you found the actual ingredients that are in the bun. Anne - watch your self and your totally rude comments! I am a size 16 with a totally normal BMI. A size 16 is not "still large". It all depends upon your shape, height and percentage of body fat. I know people that weigh only 140bs but are obese. As someone with a "nutritional degree", I would expect you to understand these principles.